Integral Powertrain have become the company to look to for electric motor technology innovation and performance. Its motorsport products, developed to break records and win races, form the DNA of a growing number of applications that are reaching diverse markets. As a result its e-Drive team expects a high level of interest when it showcases world leading electric motor and inverter technology at this year’s Electric & Hybrid Vehicle Technology Expo Europe Conference and Exhibition (E&VHT Expo). Taking place in Stuttgart from the 7-9th May, the exhibition and conference is billed as the largest trade fair for hybrid and electric vehicles. Visitor numbers are expected to reach over 8000. They’ll have plenty to talk about as the sell-out exhibition holds 400 plus exhibitors from across the globe. Running in parallel to the trade fair is an expert-led conference. It will give delegates the opportunity to learn about the very latest breakthrough technologies and their drivers. Deep diving key areas of interest the 120 plus speakers, including Integral e-Drive’s very own Jason King, will support delegates as they develop strategies and plans for the transport and mobility systems of tomorrow. 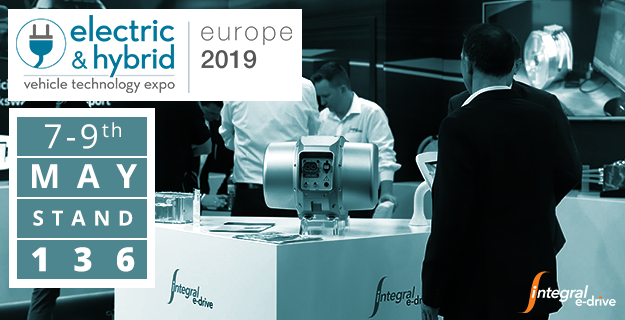 Integral e-Drive’s purpose built stand (#136) will give visitors access to senior e-Drive team members to talk about the leading electric motor technologies on display. The motors, inverters and e-Axle’s illustrate the impressive performance that has been created to meet advanced motorsport applications. They are, in turn, fuelling a new breed of powertrains for the automotive and aerospace industries. The technologies provide an exciting back drop to discussions with OEM’s as they consider what’s new and what’s next for their own e-Mobility products and services. Integral e-Drive’s Business Development Director Jason King will present within the Electric & Hybrid Vehicle Technology track on the 8th May. Jason’s presentation entitled ‘Race to the Clouds – From the Record Breaking VW I.D.R Pikes Peak Car to the Road.’ will delve into the record breaking and multi-award winning VW I.D.R Pikes Peak Car’s powertrain. He’ll explain how innovative motorsport technologies and lessons learnt on the track are already being applied to non-motorsport applications through Integral e-Drive’s ‘Track to Road and Air’ initiative. Following his presentation Jason and the expert panel will discuss the latest electric powertrain technologies used in Formula 1 and Formula E, amongst others. It will explore how these innovative and advanced technologies developed on the track, may be exploited within commercial applications and within diverse markets. On the final day (9th May) at 10:30 the team will provide a live demonstration of their high performance and integrated electric motors and inverters as a show Product Showcase Demonstration on stand #136. Attendees will be able to learn more on the selection of motor and inverter technologies including the combined inverter/motor that powered the Volkswagen Motorsport I.D. R Pikes Peak race car to its double record-breaking ascent last year from Integral Powertrain who develop and manufacture the most power dense electric motors for automotive, motorsport and aerospace sectors. Why not reserve your free place today and register here? Follow us on Twitter, LinkedIn, and Facebook to keep up with the latest news and exciting developments at Integral e-Drive.